On the Sunday evening we meet her, Usha Rajagopalan has an odd spat to resolve. The Common Coots that flock to the Puttenahalli Lake are caught in a brawl with other birds. "They are territorial," she says, adjusting the cloth sling bag on her shoulder. "If other birds visit the lake, they are shooed away. I am tempted to tell them, 'Kyun jhagadte ho, bhai (What's the fight for)? This lake is for everyone'." Ironically, it's a squabble that she and her colleagues Arathi Manay, Nupur Jain, OP Ramaswamy and Prasanna Vynatheya — the team behind Puttenahalli Neighbourhood Lake Improvement Trust (PNLIT) — are glad to witness. Five years ago, no bird made its way to the 10-acre water body that stands in BBMP ward 187, between upmarket residential complexes Brigade Millennium and L&T South City. Once a source of drinking water, the smallest of three lakes in the JP Nagar's 6th and 7th phase area, Puttenahalli had become a dumpyard for sewage, garbage and construction debris and was rimmed by slum encroachment. Rajagopalan, the first woman to raise a voice against the pollution had moved to the city from Manipal with her husband and two children in 2006. Having witnessed the civic nuisance for two years, she decided to dash off a 'save the lake' letter to fellow residents from the complex. "They said I shouldn't bother. We are tax payers, and it was the government's job to protect the surroundings, they told me." Undeterred, she first decided to track down the "owner of the lake". Was it Bruhat Bengaluru Mahanagara Palike (BBMP), Bangalore Development Authority (BDA) or the forest department? That's when Rajagopalan's neighbour and urban activist Dr Ashwin Mahesh requested the BBMP to include Puttenahalli Lake in the list of lakes for restoration. Lake ecosystems are important because they help lessen the blow of floods and drought by being reservoirs of water, not to mention that they are great at replenishing groundwater supply and support biodiversity. In April 2010, restoration began and PNLIT was formed. That year, on Earth Day, the Trust managed to raise Rs 48,000 from residents. Since then, it has been successful at convincing the Bangalore Water Supply and Sewerage Board to divert sewage away from the lake through an underground drain. A diversion channel built on Brigade Millennium Avenue Road has ensured that 50 per cent of the lake is now filled by rainwater. The lake's become home to 62 bird and 15 butterfly species. The track built around it is now a popular joggers park. With an MoU signed in 2011 between BBMP and the Trust, making this the first citizens' group to officially maintain a lake in the city, Puttenahalli's restoration is one of the biggest private-public partnership success stories. 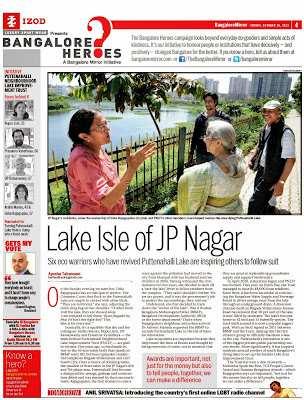 More significantly, it has inspired residents around another of south Bangalore's dying lakes to set up the Sarakki Lake Area Improvement Trust. The Trust has won a slew of awards — Mahindra Spark the Rise, TCS People's Green Award and Namma Bengaluru Awards - which Rajagopalan says are important, "not just for the money but also to tell people, together, we can make a difference."